I've been continuing to contribute to my 401k, and I still have a fairly aggressive blend of investments there. And with the kind of share prices we've fallen to, I've been thinking about perhaps even buying a few individual stocks again, a few good dividend-paying blue chips that may be relative bargains right now. But when I see things like that chart, I wonder if my dad was right all along when he seemed to scorn the stock market as being a risky, rigged game that was better avoided in favor of conservative investments. And this is a man who has a real defined-benefit pension-- it's not like he even had to worry about losing all his retirement income! What's scary is that some of this isn't even about the underlying value of the companies. It's about panic and herd mentality. So far I've had the nerve to stay the course and hope I can benefit from the poor choices of others. But at other moments I start thinking "30 years to retirement isn't going to be enough..."
Please stay away from stock market. You will lose money, faster than you would think. 401K are horrible ways of investing for two reasons. 1- there is hidden fees associated with mutual funds. No matter you make or lose, mm are making money. 2- you always need to invest in the long side, without a hedge. No options. This is very risky, in bear markets. Try to put the money into mm funds rather than catching falling knifes. Yes, that chart is really scary. I have a little bit longer than 30 years, so I am PRAYING that things turn around soon. I just bought more GE stock the other day, and I don't want to regret it. No event in history is exactly like a future event. Is the Japanese market possible? Yes. Is it probable? No. The real reason Japan's stock market is like that is because they have never started being consumers again after their crash. Do I think we will cut back for a long time? Yes, but the US consumer cutting back as far as the Japanese consumer has is unlikely. If it happened it would be one of the greatest societal changes in the last 200 years. We are ridiculous consumers. We just need to be more responsible, which is more likely than never buying anything again. The stock market will rebound in 30 years. It always does. Maybe I'm too confident, but I have to be to stay sane. If the US were a company, would you put all your money in that one stock? Probably not! 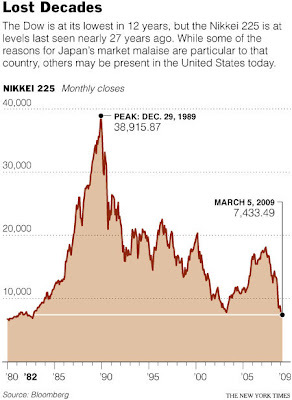 If the US market tanks like Japan, does that mean you can't make money by investing? Nope. There's how many other countries in the world? Diversify! Invest internationally. No one can predict the future. It really depends on how much risk you are willing to take. Some people get physically sick when they lose money. In the end, all experts agree that we should diversify. Have you thought about buying foreign stocks? It is like how one should not buy too much stock of one's own company. Should the worst come, one can lose both job and savings. I'm looking into investing in foreign companies, like the ones in Africa. Any thoughts? Is it just me or does it look like that chart's giving us the finger? "In the end, all experts agree that we should diversify." - Not all experts agree on this. The majority of investors in the hall of fame (Soros, Rogers, Buffett, etc.) are advocates of big bets by active investors on quality companies. If you aren't an active an investor just put your money in bonds and be done with it. - Diversification didn't do anything during this downturn. It didn't matter if you were in Europe, Japan, China, etc. Buy your straw hats in the winter as the saying goes. Only problem is that it has been a long harsh winter. I took a look at the 50 year S&P 500 chart and a dose of that, along with a final charge to end today's session brought me back to reality. 1) As far as staying away from the stock market, yes there are associated fees etc. But it's still been (one of) the best investment medium over the last 50+ years. It's like driving a car for 20 years, then you get in an accident and say "stay away from cars because they're dangerous." Sure they are, but that doesn't mean you should never be in one. What is really frustrating to me is that all the standard rules (buy and hold blue chips and diversifying) don't seem to work anymore. How is anyone going to save for retirement? I learned to trade options. If I buy a stock, I buy a put option with it...basically buying insurance for my stocks. It's a bit hard to learn how to do it right, but it is protecting my family's money and more importantly, our sanity. Yup, I agree: the chart's giving us the finger. Well, even Buffett is losing in this market. Where were these comments at 14,000? Good luck to all the market timers and peeps paying put insurance. With 30 years, I would keep buying long. If your return does not beat inflation in that period when buying in installment, rather than peak to peak analysis, then we have bigger problems than a mattress will not solve. And it’s cliché but we are not Japan, just going through a long rough period, but not 30 years. At least I will put my money on it. Sure Buffett, Soros, etc. are the Tiger Woods of investing, but me throwing out my name and a few people I know who are active investors and beat the market wouldn't mean anything to anyone. Diversifying has not reduced your risk in this environment. My work 401k which is "diversified" like all the "great" financial planners recommend (because I have no other choice) got absolutely destroyed compared to my personal focused investment accounts, which I can do anything with. Anyone who trusts the standard advice is doomed to be a wage slave forever. Concerning Buffett's advice. He qualifies it by stating "most" investors. The reason being that most investors want to spend 5 minutes a year on their investments. They want to push the work and responsibility for their retirement onto someone else. Of course, this attitude pervades our lives and our current situation is the result of wanting something for nothing. Not to worry, like the moron President says, the market's just like a "poll". it goes up and down. Of course, no one ever lost their life savings on a poll. But our President is infallible so I'm not worried. diversification force your rate of return closer to the mean rate ofreturn of the market. if the mean rate of return is negative, you will end up with negative return. if everyone makes money out of the market, where does that money come from? the rest of us have to lose for the above 3 groups to win, collectively. i'm mostly in equities and continue to contribute heavily in equities, too. i just don't care, because i just don't see any point in buying bonds when i'm 30 years or so out. the market with rebound some day. may not be this year, may not be next year, may be 10 years. i'm not worried about it. if i relied on experts, i would be just as confused as all the experts out there. i keep buying, i keep buying more than i did then. if i'm wrong in 30 years, then all your kids will be supporting my medical bills and social costs anyways. so please have more kids.